This portrait was created from a mock up of 3 photos to create the composition. It was decided to superimpose a different head onto the body in this image as the original photo looked anatomically incorrect due to the photo being taken from above and a little too close - however the cut and paste images although it appears rather untidy in the reference photo, allowed me to create a highly effective painting and gave the Commissionee a good idea of how the finished piece would look. 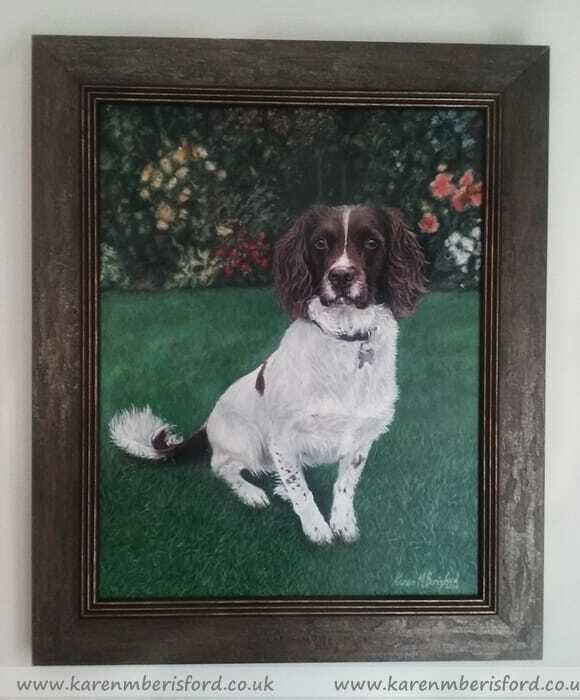 ​I'm sitting looking at Buddy in pride of place on the wall, photo attached! It is absolutely lovely and it had the desired effect on Steve when he unwrapped - there were tears!! Everyone that has seen it has said how amazing it is with the amount of fine detail and so Buddy. If I manage to get a decent photo of Buddy next to it I will send it on!